We are a small family business with the emphasis on providing a friendly, personal and professional service. 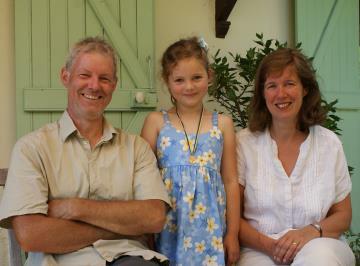 My name is Ross Husband and in 2005 I moved from Scotland to live in the French Pyrénées with my wife Karin and our young daughter Anna. Our reasons for starting this business are fairly simple. We have had a great love of France for many years and have enjoyed numerous wonderful holidays here. Back in 2004 we had been trying to find a suitable property ourselves to rent for a longer period of time. This seemingly simple task took hours of frustrating searching and fruitless enquiries before we found something to meet our needs. It was then that the idea of creating our own website specifically aimed at promoting longer term lets in France came about. Our intention is to provide a user friendly service whereby anyone looking for a longer term let in France has easy and free access to a good choice of different properties throughout France, and likewise property owners have a specialised internet company dedicated to promoting their properties for long lets. Our site was the first to specialise in these longer rentals. Much has happened since those early days. We are now celebrating over 13 years in business and our site carries hundreds of property adverts with over 200 comments on the testimonials page from satisfied clients. Personal recommendations are our driving force. The site is constantly being developed and now offers greatly enhanced search facilities and interactivity. The look has been refreshed and modernised and much work has gone on 'under the hood'. We hope you find our site informative, useful and easy to use. We welcome feedback so if you have any comments or questions please do let us know. Here's to your extended stay in France!